Great interactive book for a full group or one on one with a child in your lap. An animal appears on a page but what is it really? A rooster... but it is really an alarm clock. Creative and funny. Allows kids to use their imaginations. Good repetition and picture clues for beginning readers. Can't wait to use for PreK Story Class. Along the lines of "Not a Box" and "Not a Stick," this book re-imagines different animals as what they are useful as. For example an elephant is not an elephant, she's a shower! A kangaroo is a grocery cart. Kids will love guessing what each animal will become. And by the way, this is not a book; it's a ...? 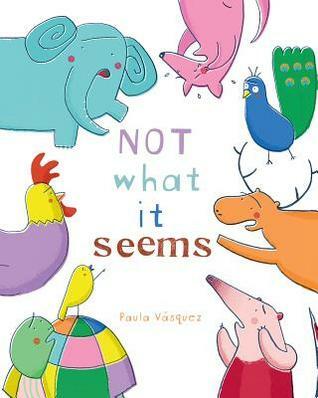 A playful picture book that shows that appearances can be deceiving. An elephant is not an elephant. A turtle is not a turtle. Readers (as well as the animals mentioned) will be surprised by what they are!